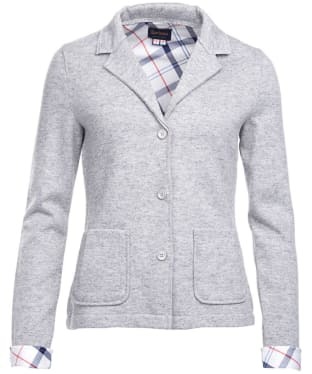 Shop for women's woollen jackets at Outdoor and Country. 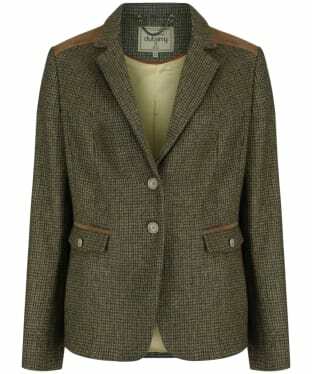 A carefully selected range of beautifully crafted woollen and tweed jackets are now available for discount prices at Outdoor and Country. Wrap yourself in luxury with these gorgeous woollen jackets for women, plus with savings like these, we highly recommend that you take a closer look. 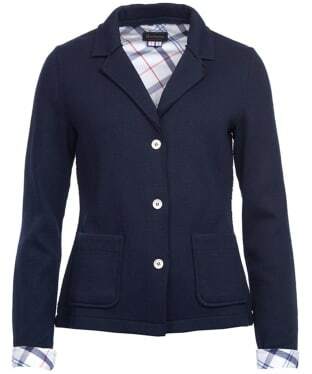 Discover this gorgeous collection of women's woollen jackets for less at Outdoor and Country today. 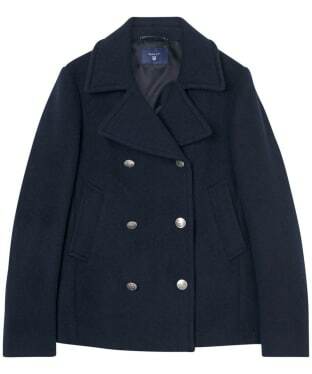 The Women's Barbour Ettrick Tailored Jacket is a wardrobe essential for any stylish lady. 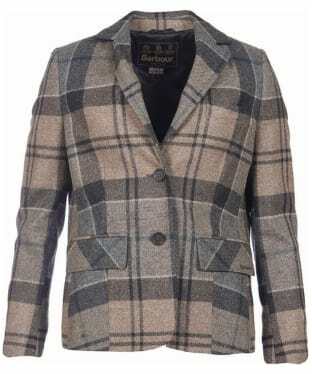 Created in pure wool with a timeless check in warm hues inspired by Barbour's signature tartan, we know that you will love the timeless feel that this jacket offers. Cut to a feminine silhouette, the Ettrick has a flattering waist seam and curved front and back hems to flatter your figure for an elegant look. 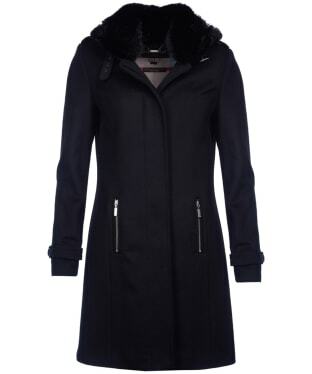 This luxurious jacket boasts a detachable faux fur collar for that added touch of glamour, as well as leather pocket-flap piping for that premium finish. 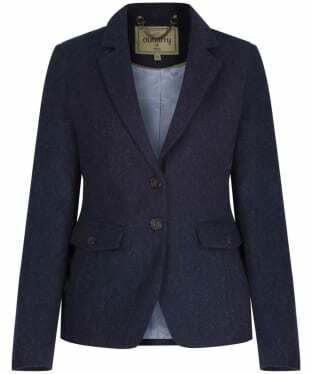 Elevate your go-to jeans with this elegant and richly detailed blazer. 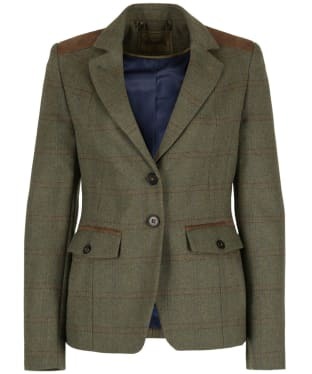 Great for town or country, the Alan Paine Combrook Blazer is a classic fit tweed blazer with contrast wool collar and pocket trims. 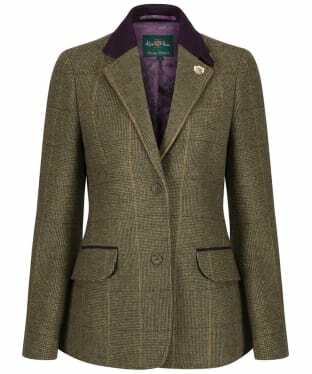 With a water repellent outer for protection against adverse weather, this traditional tweed blazer comes complete with two flap pockets to the outer, and an internal pocket for added security. Fully lined with a striking jacquard for a premium finish, this Alan Paine blazer is cut with two back vents to aid movement, meaning you will always feel comfortable while looking stylish. The Women's Barbour Leathen Knit Jacket is an elegant hybrid style that pairs a tailored blazer aesthetic with a textural boiled-wool construction to create a modern, adaptable knitted jacket. Featuring a buttoned front fastening, two pockets for your added convenience and raw-cut edges, the Leathen is finished with a half buggy lining and turnback cuffs in Barbour's sophisticated Summer Tartan, for that added touch of quality and style. Pair the jacket with your favourite Barbour jeans and shirt for a smart casual look that is sure to keep you on-trend through this season and beyond. 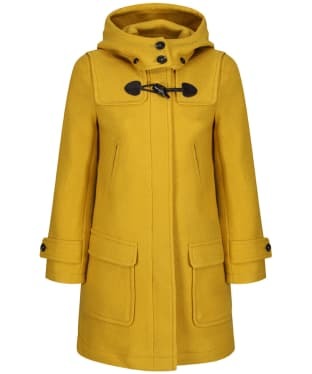 A stunning addition to any stylish lady's wardrobe, the Women's Barbour Balmedie Wool Coat is a luxurious piece perfect for those cooler days. 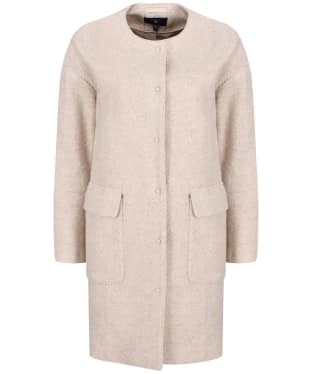 The Balmedie Wool Coat is a feminine design created with a wool-blend outer containing a dash of cashmere for a sumptuous feel that you are sure to love. Cut to a comfortable yet flattering silhouette, it features a funnel collar and a concealed placket to keep those chilly winds at bay whether you are taking a stroll through the country or simply heading into town. The Belmedie has shoulder epaulettes and cuff straps for that added touch of stylish detailing, as well as zipped pockets to keep your personal items secure whilst you are out and about. 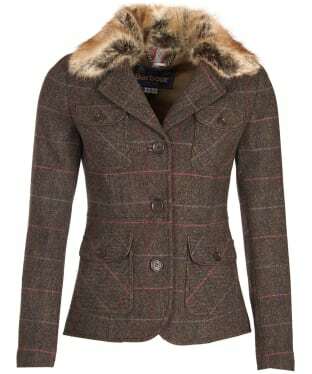 A detachable faux-fur collar and Barbour Tartan lining add a luxurious, glamorous finish to this beautiful jacket. 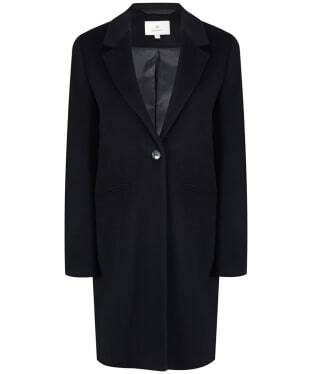 Wear this long-line coat for a refined finish over both smart and casual looks. A stunning addition to any lady's wardrobe, the Women's Barbour Crieff Cape is sure to keep you cosy on those cooler days. Featuring the iconic Dress Tartan, the Barbour Crieff Cape is crafted in a wool blend with a dash of cashmere for an extra-luxurious feel. It fastens with a two-way zip through to a funnel collar to keep those chilly winds at bay. The Crieff is complete with a detachable faux-fur trim for that added touch of winter glamour that we know you will love. Whether you are heading into the town or country, this beautiful cape is detailed with functional welted pockets so that you can store your personal essentials with ease and stud fastenings at the hem for ease of movement. 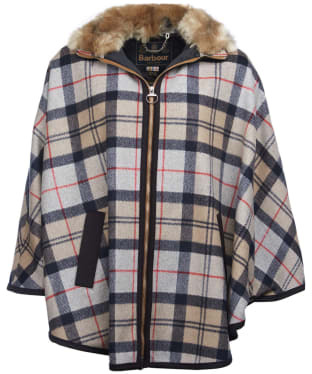 This feminine cape makes a versatile and elegant layer for the colder months. 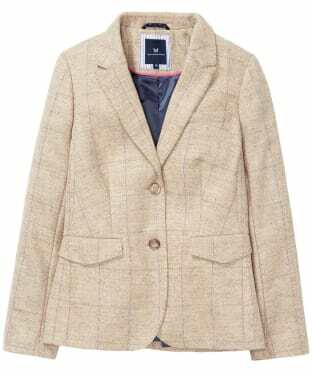 A stunning addition to any stylish lady's wardrobe, the Women's GANT Diamond G Classic Tailored Coat is the perfect finishing touch to your elegant ensemble. This tailored coat has been designed with a straight cut and to a slim fit to offer you a figure flattering, feminine silhouette that you are sure to love, whilst still allowing room for that down jacket should you need extra warmth on those frosty mornings. 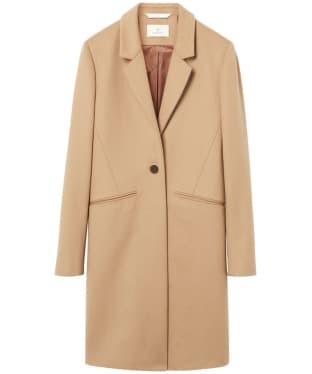 An essential piece for when the weather starts to get cooler, this coat has been crafted from the highest quality wool and cashmere blend sourced from Italy for that added touch of luxury and a warm, cosy feel. To the interior, you will find GANTs signature weave printed lining to offer a fashion forward, iconic look that will add to the on-trend feel of this exquisite coat. For your added convenience, there are two welt pockets to the front to provide space for your personal essentials whilst you are out and about. Designed to be your go to coat no matter what the occasion, this timeless piece features seam lines to the front for waist definition as well as a single corozo button closure for a simple yet sophisticated finish. Crafted from a cosy wool blend, the GANT Bonded Wool Pea Coat is a smart winter coat with distinctive military style detailing that you are sure to love. This gorgeous GANT coat includes silver-look branded buttons to the double breasted fastening, giving the jacket a stunning sense of balance and creating a flattering silhouette. Slanted pockets feature to the sides for added convenience, while the half torso and full sleeve lining allows for fantastic ease of movement and extra insulation on cool days.